I had quite an interesting day last week. So interesting, in fact, I decided it would be the subject of my posts for the week. Truth be told, it's not really all that exciting unless you're a foodie (I'm not exactly a lion tamer) but I did manage to get three awesome food experience in one day, and it happened to be on the day that I decided to bring Rina's camera to work- So i just happened to capture everything on (digital) film. My day started on a rather sad note, because all my lunch buddies at work were preoccupied, leaving me to fend for myself (I hate eating alone). Just when I was starting to contemplate skipping lunch all together, my cousin Paolo gives me a call out of the blue, saying he's got some free time for lunch, and asked if I wanted to join him. Since I had my camera, I told him i thought it would be a great chance to get more material for the blog, so I grabbed my camera, and he picked me up. Since it's so near our offices, Greenbelt was the default place to go to. Since I don't have a Japanese post yet, I suggested John and Yoko, which he was very much game for (Ecstatic, in fact. I wonder if the girls in the short skirts had something to do with it.. hehe kidding bro.. you know I love ya..). 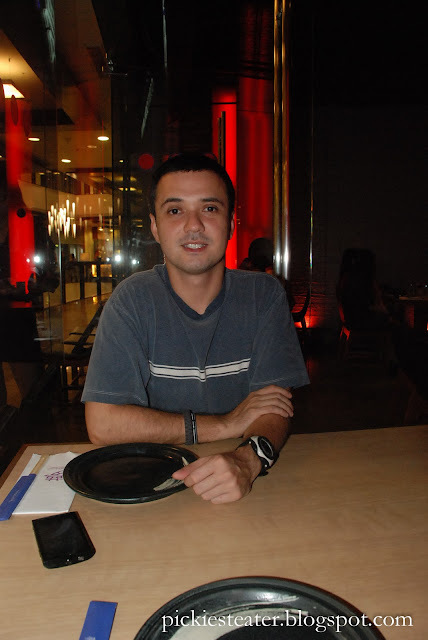 Though he's MUCH older than me, my Kuya Paolo and I are very close, mainly because we share the same wavelength. Growing up, we would think or say the same things at the same time.. It was uncanny. We're both busy with work so we don't get to see each other so much, but as luck would have it (totally unplanned), we're practically in the same line of work, doing practically the exact same thing, except we're working for different companies. He's been suggesting places for me to go for quite some time now, and my first attempt to go to a place he suggested, ended up in failure (It closed down the week before I went.. darn it). All you need is the "toogz toogz"
John and Yoko has more of a night club vibe to it. 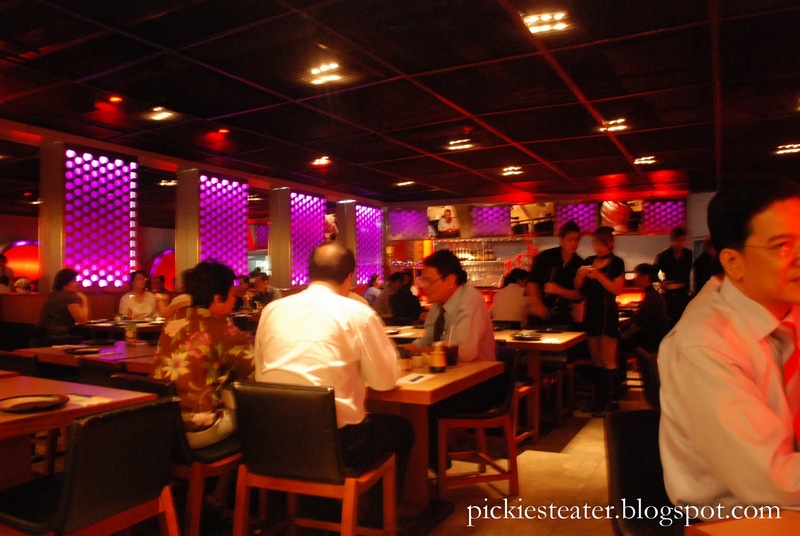 (I don't get out much at night so maybe i'm not the best judge) from it's dim lighting to the ultra modern purple lighting accents around the walls, hell, especially with the hostesses in the short mini skirts and knee high boots, you almost forget that you're in a restaurant. It's a nice place but far from the "homey" feel that I enjoy. 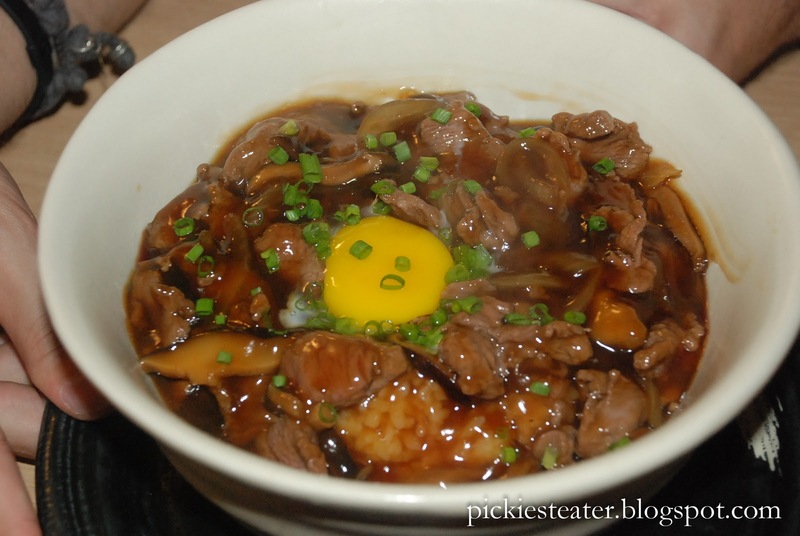 Pao had eaten there before and was raving about the Gyudon (P228) he had when he was there, and so he ordered that again. It arrived on our table still smoking hot, with a thick sauce and raw egg on top. I took a small bite from Pao, with the egg already cooked and mixed into the meat and sauce, and found it to be quite delicious. The thinly sliced beef strips were tender and easy to chew, and the hint of sweetness of the rich sauce was impeccable. And in the great tradition of Japanese rice, it was delicately soft. I liked it enough to not notice the sliced up mushrooms so much hehe.. I'm not really a big fan of Japanese food. Whenever I'm in a Japanese restaurant, my orders revolve around Katsudon, Yakiniku, or Chicken Teriyaki. (mostly sweet meat food, as you may have noticed) Other than that, I don't like eel, octopus, or any other weird raw stuff that they wrap around seaweed and serve up. (I did mention i'm a picky eater, right?) However, as I browsed through the menu, the order that was created by angel's in heaven's kitchen specifically for me became clear as day once I looked at the menu. 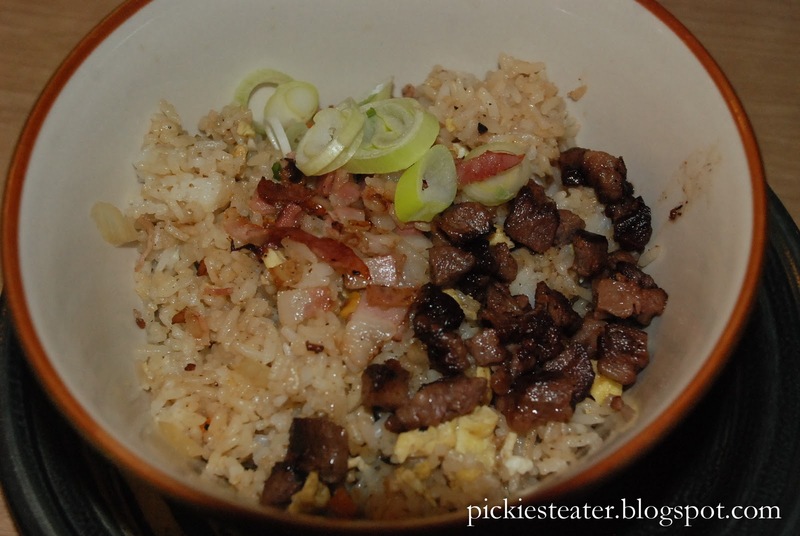 It was like mana from heaven when I discovered that John and Yoko had a "Wagyu Bacon Rice" Bowl (P308). I seriously didn't even bother looking any further in the menu, because it was very unlikely that I would find anything remotely close to topping that. Although I admit of not being too fond of food from the land of the rising sun, I really do love Wagyu Steak. But that's more a testament to my love of steak than it is my love for Japanese food. And when you add my all time favorite food (bacon) into the mix, the game is over. 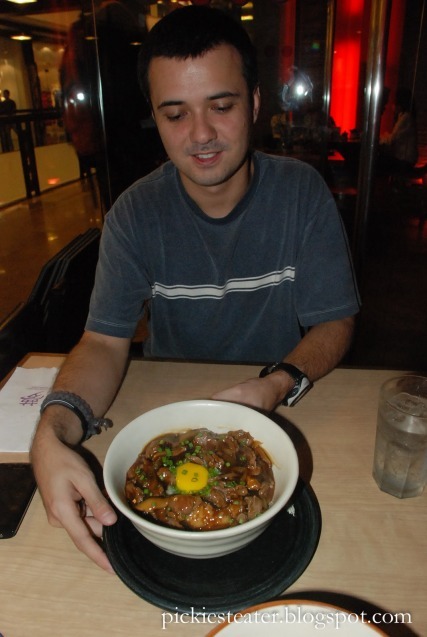 When they brought the bowl in front of me, the savory smell of the steak was unmistakable. Unfortunately, it raise my expectations. 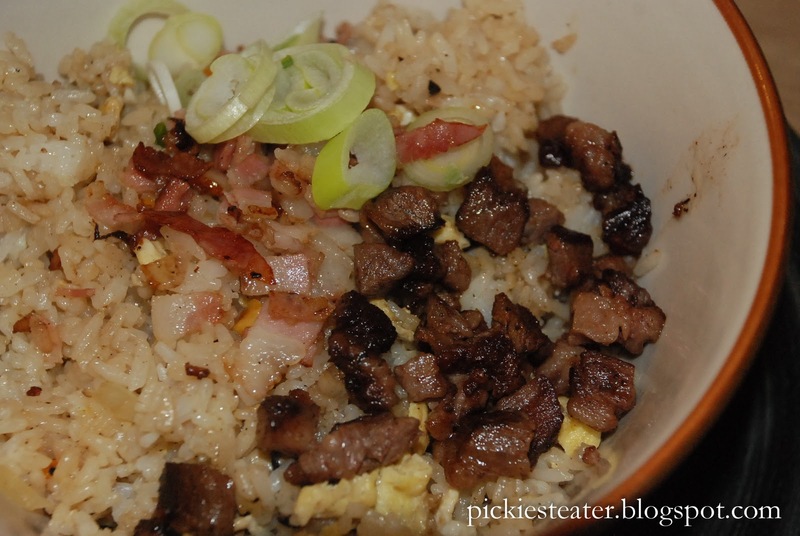 I was expecting a full bowl of steak and Bacon strips scattered all over the mixed japanese fried rice - which was essentially what I got.. except change the word "Strips" to "Bits". I'm supposed to get full with THAT? After a closer look at my bowl, I couldn't help but feel slightly disappointed by the amount of steak and bacon they used. I had to mix the meat around the rice bowl, just to make sure i don't get all the meat in one spoonful (which was an actual possibility). What you see on the picture above was is what the bow looks like without me digging into it yet. You can barely see the bacon (A slap on the face to bacon lovers everywhere). Taking a mouthful of it, both made things even more frustrating, because it tasted really good. It made me wonder how much more awesome it could have been had they added more steak or bacon. I know they wanted to keep the price lower, but the portioning was just ridiculous. Its a very good thing that Pao treated me, so I didn't feel so bad about what I ordered anymore.. hehe.. They're lucky it was good, so I still had a smile of my face. As you can see in the pictures, the steak was a little bit burnt, but I didn't mind it so much because the charred parts gave it a smokey flavor, and the bacon, even in its pint sized form was, as always, awesome. 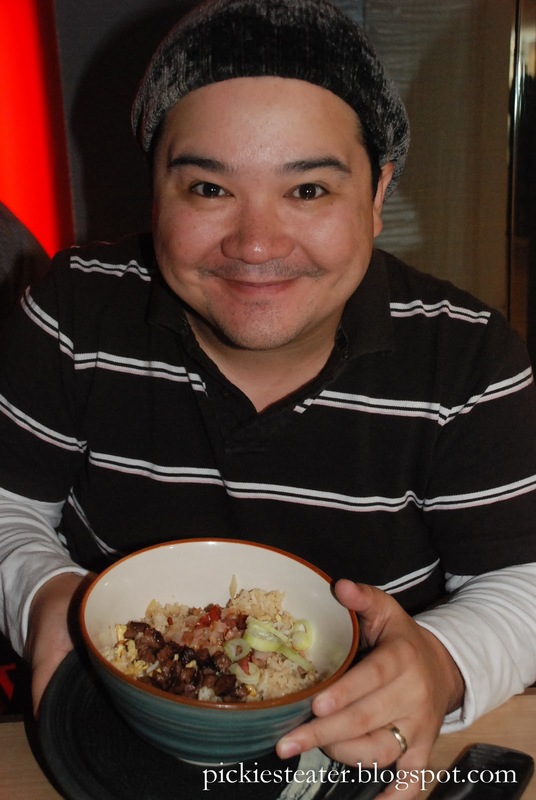 The Mixed rice was also excellent. It was a very good dish, but it was just really ruined by the portioning. And for the record, the picture on the menu didn't match the actual reality. (whoa.. online date flashback.. I'm kidding). Considering how the menu is creative and innovative, (far from the traditional roster that typical Japanese restaurants usually have) John and Yoko would probably be on the top of my mind when suggesting to a friend.. aside from the Japanese Steakhouse that has one of the best things ever.. (Wagyu beef Steak).. but that's a whole other post.. hehe..
Oh and just to clear the air.. (and before my cousin Pao kills me), for the record, he's only a few months older than me.. but he's kinda sensitive about it.. (must be old age) hehehe.. Love ya bro! ** Part 2 of "A Day In The Life" (hopefully) on Wednesday.. Your other cousin, Pat. Pao's sister. Thanks for the heads up, Joy! I've been wanting to try Kurosawa for quite some time! 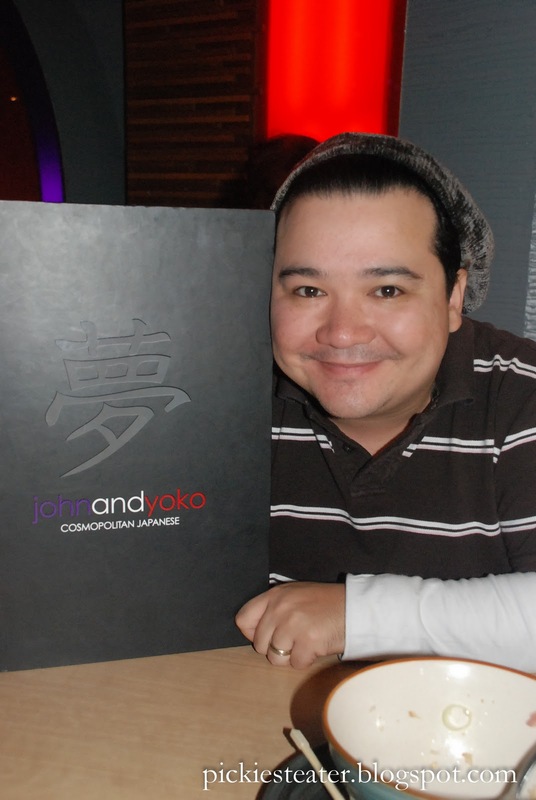 And i'll be looking for the chicken teriyaki pizza the next time I go to John and Yoko!